The beige Elite ICE Omni Earset Microphone for AKG Transmitters from Mogan offers pristine sound, low visibility, and enhanced comfort to discerning presenters or performers for applications such as broadcasting, stage, lectures, houses of worship, and more. The Elite ICE features a moisture-resistant omnidirectional capsule which delivers a rich vocal sound with full-frequency audio response (20 Hz to 20 kHz) and high gain before feedback. 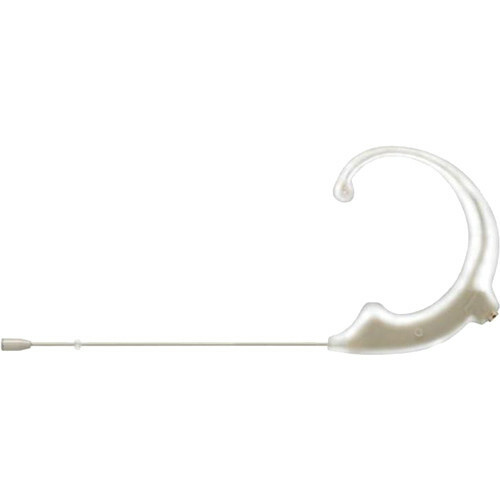 The transparent earpiece features proprietary Invisi-Clear Earpiece (ICE) technology which gives this earset an uncommonly discreet visual appearance by blending with the user's skin tone. For comfort, the thin, strong boom can be positioned on the user's left or right side, and adjusted to the contour of any face. The earset can be used with a choice of interchangeable cables (available separately) which let you connect it to most popular wireless transmitters, including models from Shure, AKG, Sennheiser, and Audio-Technica. The Elite ICE comes with five foam windscreens and an impact-resistant aluminum case. Box Dimensions (LxWxH) 7.75 x 4.75 x 2.0"